We kept the good ones, but now we have new foals and need to find homes for the good ones we're not using. Mostly these horses are too small for us and need riders under 200 pounds. All are sound and healthy. The dinner bell has rung and the race is on. 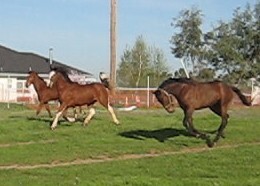 Two available mares and thoroughbred gelding. Smooth movers all. Click one of the above to see the video. Mustang mare, broke and good on trails. She needs to bond with and trust her person. Very nice moving and strong." Coming three year old filly from the mustang mare. She is very tame and friendly. 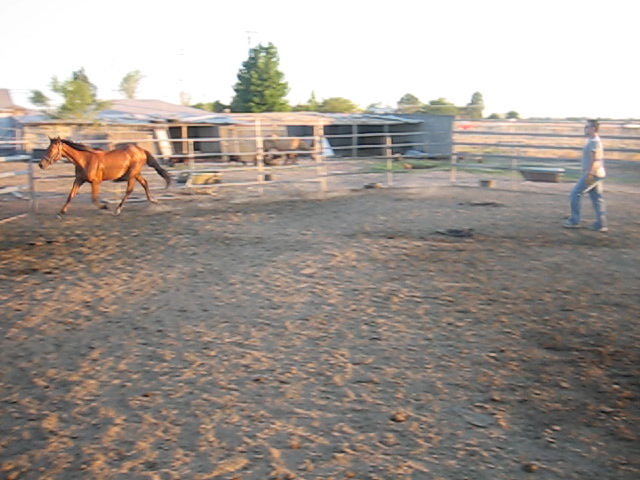 She is a great candidate for Parelli style training. She is very cute and will be a great match with a small adult or experienced older child. Lunging and showing off her smooth gaits. Click one of the above to see the video.